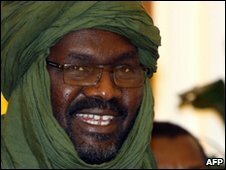 One of the main rebel groups in Sudan's Darfur region has threatened "all-out war" if its leader is arrested. Sudanese officials have asked Interpol to arrest Justice and Equality Movement (Jem) leader Khalil Ibrahim for planning an attack in Omdurman in 2008. Jem signed a ceasefire with the government in February but left peace talks earlier this month, claiming the government had launched new raids. Mr Khalil is currently thought to be in Egypt, which is an ally of Khartoum. Eltahir Adam Elfaki, chairman of Jem's Legislative Council, told the BBC that "if any attempt is made to arrest Dr Khalil then it is all-out war." "Even as we speak, the Sudanese government is bombarding areas of North Darfur and West Darfur," he said. The International Criminal Court (ICC) has issued an arrest warrant for President Omar al-Bashir over alleged war crimes committed in Darfur - charges he strongly denies. "Bashir is an indicted criminal - indicted by the ICC - and has no right to ask for anyone to be indicted by Interpol," said Mr Elfaki. After the ceasefire was signed with Jem, Mr Bashir declared that the war in Darfur was "over". Another Darfur rebel group, the Liberation and Justice Movement (LJM), also signed a ceasefire with the government before the elections. However a faction of the Sudan Liberation Army (SLA) led by Abdul Wahid is still holding out against the government and has refused to take part in the peace talks. Darfur was relatively peaceful during Sudan's landmark April elections, which saw Mr Bashir re-elected. But voting did not take place in much of the area because of the insecurity. The government says such figures are a massive exaggeration and denies claims that it backed Arab militias accused of ethnic cleansing against black African groups in Darfur.